A big issue with mid-engined sports cars is how to make enough revenue to recoup the initial investment. The three box, engine in the rear design of body tends to be expensive on materials and complex to produce. This is not so bad if you build an all out rally burner like the Stratos, when a few hundred are needed for homologation. But a full production sportscar carries more risks. Fiat's solution was to sell this car under the Lancia badge to attract a price premium. It was at the Geneva Motor Show in 1975 that Lancia launched this new sports car - the Lancia Stratos had just 'cleaned up' on the Monte Carlo Rally - so the new Beta was called Montecarlo - a famous name indeed. When I originally learned this car was the first to be completely built by Pininfarina I was surprised. It lacks a certain subtlety of curve and line I would normally associate with their designs. Perhaps my eyes are too used to their many fine Ferrari forms. Yet in 1975 the Montecarlo won several style awards. 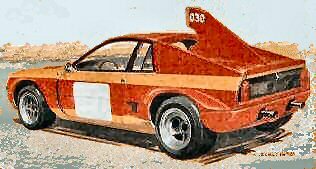 The first series were named Beta Montecarlo, but the 'Beta' was dropped later on. Precisely were would this mid engined sports coupe fit in the Fiat/ Lancia sports car ranges? Fiat's coupes are always 4 seaters, so despite the 124 CC and Fiat 130 coming to the end of their lives, substituting a mid engined coupe was not possible. The Lancia Beta range already had the successful Beta Coupe too. Perhaps this explains why this design had taken so long to come to production. Early prototyping studies of the Montecarlo certainly pre-dated the X1/9. Yet the exxie had gone into production years before it. So in the seventies 'open topped' sports cars Fiat had the 124 Spider and X1/9 with its targa. Again it is not clear where the Montecarlo fits in. To succeed in sales terms in 1975 sports cars had to sell well in the States. Both the Fiats were in demand there. This highlights a second problem for the Montecarlo - its performance. When compared to the X1/9 it was sluggish. The Monte has a slightly better top speed, but in all other ways - including fuel consumption - it barely matched its cheeper underling. As the States emissions controls rolled in, and the X1/9 got a 1500cc engine, the situation only got worse. So naming the car 'Scorpion' in the States was more about marketing hype than reality. Was the Montecarlo ever intended to have the Fiat 130's V6 engine? Well not by the time Pininfarina were involved. The V6 (with expensive Stratos transaxle) could not have been accommodated using their unitary build and design techniques. Yet the joint project with Abarth on the 030 Prototype did have the Fiat 130 V6 installed. Now I'd like to turn these points around. The Montecarlo is a thoroughly viceless and rare machine. They need more power to go as well as their looks promise. But as the car was equipped with the 2Litre Fiat/Lancia Twin Cam, finding sufficient is no real problem at all! Today, providing they are well restored or rust free, Montecarlos make an eye catching classic sports car. Few people will know what you are driving. You'll find waiting to pull out into traffic gaps frustrating, as the last car before the gap slows down to take a good look at you. Inside the Monte is well appointed. All but the first few had a leather interior. You can acquire interiors if necessary as there were enough sold to make second hand spares a possibility. Driving the Montecarlo is pleasant and rewarding, and apart from the slightly slow gear change these cars have few bad points. You'll find the road holding and road manners good. On the move there's a lot more noise and vibration than in today's sports cars, yet the car's ventilation is adequate in all but the hottest weather. Like the X1/9 it gets hot on long journeys - but an air conditioning option was available and in the UK we rarely suffer humidity levels that would preclude opening a window! The Series 1 Beta Montecarlo was produced between 1975 and 1978 by Pininfarina. And there was a delay of about 9 months before the first right hand drive versions were available on both the first and second series. In 1978 production was suspended, while Lancia conducted an upgrade of the car. The 13inch wheels were replaced with 14inch and larger brake discs used. The troublesome front brake's servo was removed. Power remained at 120bhp from the 2 litre unit, but torque was increased throughout the rev range. Both front and rear tracks were increased by 10mm on lower profile tyres. Grills and badges were changed, and the Beta prefix was dropped from the name so it became the Lancia Montecarlo. The revised model was introduced at the Geneva Motor Show in 1980, exactly five years after its first launch there. "..a superb sportscar" trumpets the publicity from the launch. I think its time this classic received more of the recognition it so justly deserves. Meanwhile, back in late 1980, plans were afoot from Lancia and Abarth to begin a world rally championship makeover of the Montecarlo. This was to become the 037. The table demonstrates some of the key milestones in competition car performance by Abarth, Fiat and Lancia. The Montecarlo has been used as the basis for motorsport throughout 15 years, with the cars using the Montecarlo chassis listed enboldened. Some of Fiat's famous 'X' code development projects take time coming to full maturity. And the Montecarlo is one of the longest. During the sixties, Fiat had experimented with front wheel drive transverse engine designs, themselves based on the '123' prototype projects of 1958-59. This led from the 1964 Autobianchi Primula and on to the Fiat 128 and X1/9 in the 1970's. The X1/8 and X1/9 projects used a transverse engine layout from a front wheel drive design, but placed at the rear of the car. This gives a mid engined layout in a 'three box' body monocoque, with the gear box linkage being operated from in front of the engine. The X1/9 project retained its development code into production - mainly due to the persistence of Nuccio Bertone. Bertone had convinced Fiat to adopt this layout for the 128 range sports car, rather than the traditional front engined replacement for the 850 Spider they had expected. The Bertone design itself followed closely on that for the Lancia Stratos and Lamborghini Miura - and Bertone funded the build of the Runabout (or 'Barchetta' - 'Little Boat') prototype to help demonstrate the viability of the mid engined design. In 1970 full production design began... and the X1/9 name was retained partly to distance the sports car from close association with the 128 range. The Montecarlo derives from a second line of development started before the X1/9, looking at the design options for a medium size sports car. The world's positive reaction to the Stratos had been much greater than expected within Fiat. And this had removed some doubts about wedge shaped mid engined sports cars. So the G.21 prototype that extended into the X1/8 project era in the sixties and had been extended into the X1/20 project was 'dusted off' again. Some versions of this development used Fiat's famous Twin Cam engine. And convinced that the day of the classic wedge shape had arrived, Fiat eventually gave the development task to Pininfarina. The final decision was to more closely associate the car with the Stratos' competition succes by naming it after the rally that the Stratos had dominated. The Montecarlo was put into production during 1974 and officially launched early in 1975 at the Geneva Motor Show. During this phase the engine choice was also settled, as V6 Ferrari power (like the Stratos) had been an option. In the 1972 Giro d'Italia (Tour of Italy) a prototype (Abarth - Pininfarina 030 An artists impression of the Abarth 030 can be seen here) had finished second to a Stratos. But in 1974 the Fiat Lancia Twin Cam was selected. The Lancia Montecarlo was to be the first production car to have a 2 litre capacity version. Like the Fiat 124s and other seventies Italian sports cars, finding spares for the Montecarlo has never been easier. More parts with consistent quality are available today than for the last twenty years. Betacar Fiat and Lancia parts specialist in Bradford West Yorkshire on 01535 275560. US based parts with connections to Bruce's Parts Bin too. Omicron Engineering in the UK. Omicron Engineering have established a good reputation for supplying all the Lancia parts. The Monte Hospital in Herefordshire have steadily built up parts and performance tuning lists for your Montecarlo. Check out Monte Hospital for spares and advice. More parts advice from the States from one of the oldest sites started By Huib Geurink back in 96!